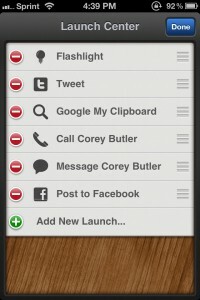 Launch Center - Flashlight, shortcuts, and more! 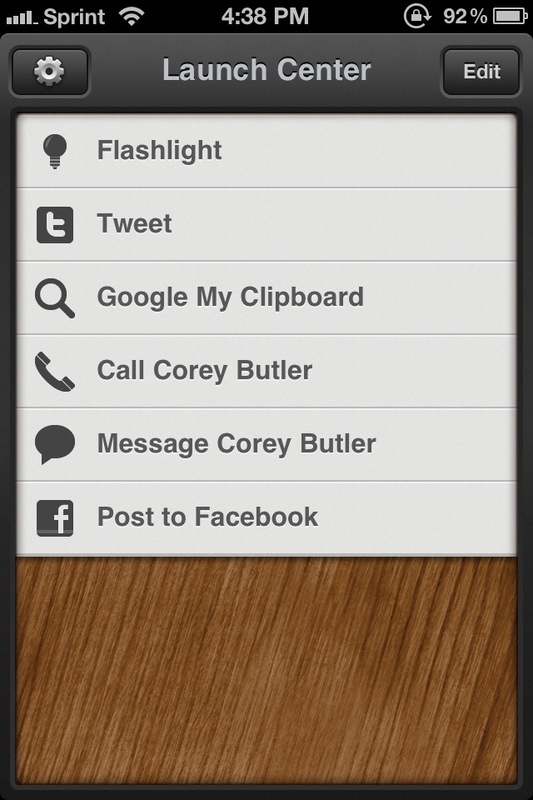 ($0.99) by App Cubby is an app that allows you to quickly do your most-used actions, all from one convenient app. 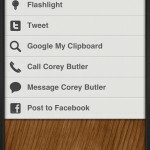 I'm a fan of App Cubby's beautiful interfaces, as I mentioned in the last review with Tweet Speaker. 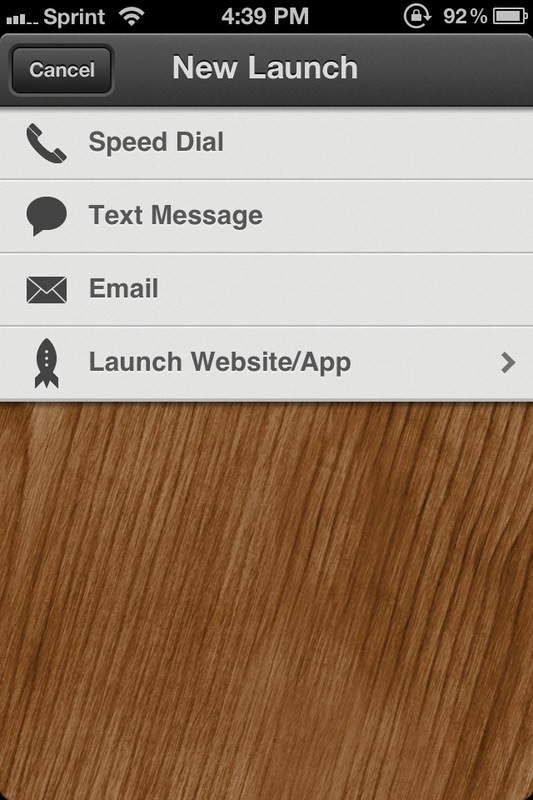 The design of Launch Center is just like Tweet Speaker, so I was pretty happy when I saw this. 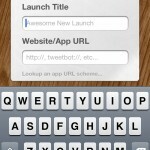 When the app is launched, you will see a list of default actions. 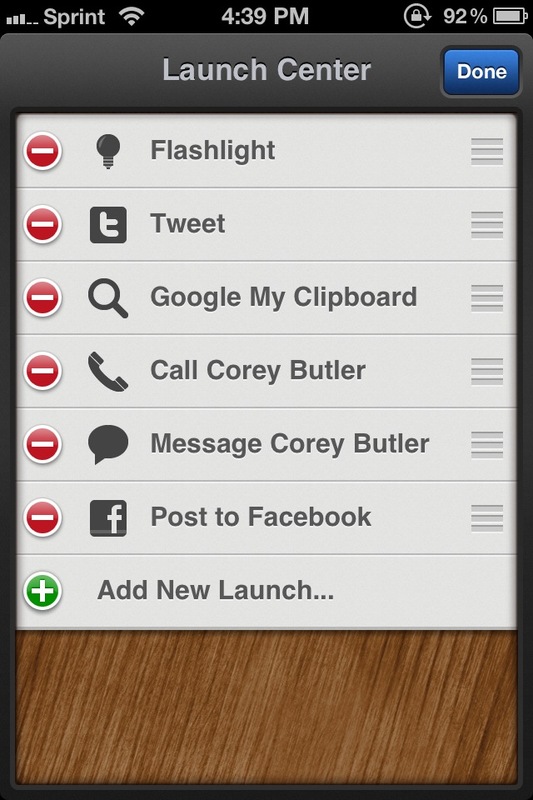 As well as some useful functions like tweeting or Googling whatever is on your clipboard, Launch Center includes its own Flashlight option. When you launch this, the LED flash on your iPhone 4 or 4S will turn on, and the screen will have a big blue button (love how it looks) that will allow you to turn it off. It’s a great way to light up your way in the dark. Even though the app already comes with some basic functions that would be useful, the real fun comes in making your own shortcuts. To do so, just tap on the Edit button. 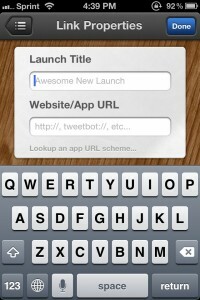 This will allow you to delete or reorder the currently existing launches, with the option to add your own at the bottom. 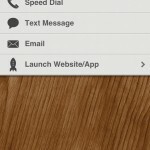 When creating a new launch, you are given a few options: make a speed dial call, new text message, email, make a Facebook post, or launch a website/app. When adding a speed dial, text, or email, the app will prompt you with your contacts, so you can quickly contact that person in your preferred method. Selecting a contact will ask you which phone number or email to use, even if you only have one for each. When creating a launch for a website or app, you will be prompted to give it a title, and then link it with the website or app URL. 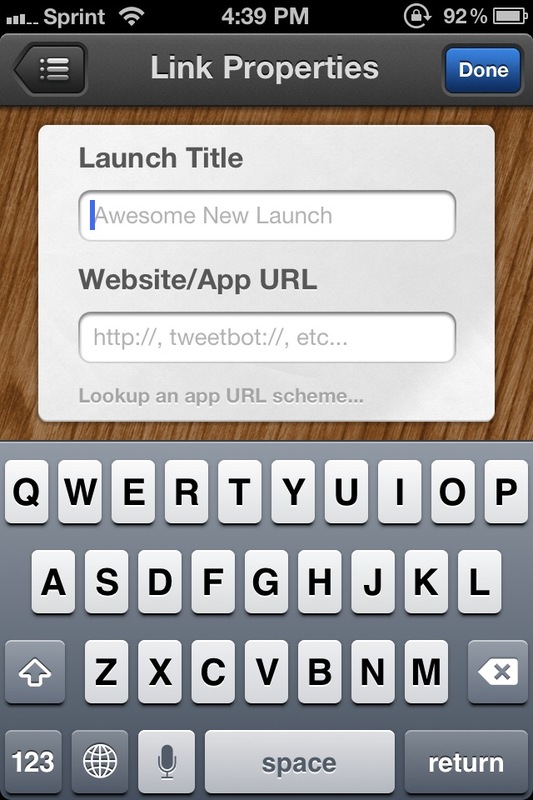 If you're confused by the app URL, you can take a look at text field before you start typing for examples. A full list of URL schemes can be found here. Selecting one of your launches will immediately take you to that action, whether it’s making a call or posting on Facebook, or even sending out a tweet (or perhaps opening up your favorite Twitter client). 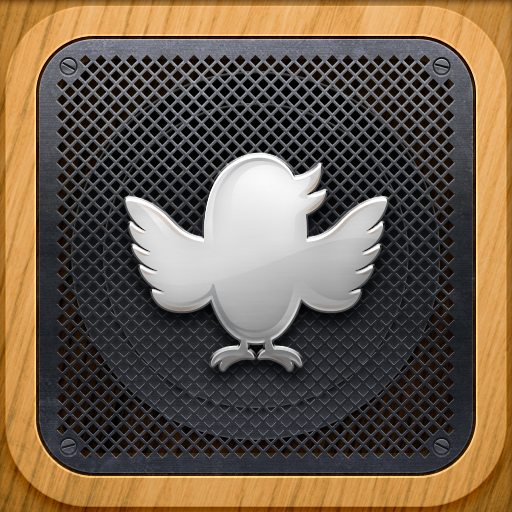 It’s fast and easy, and the interface is just gorgeous. 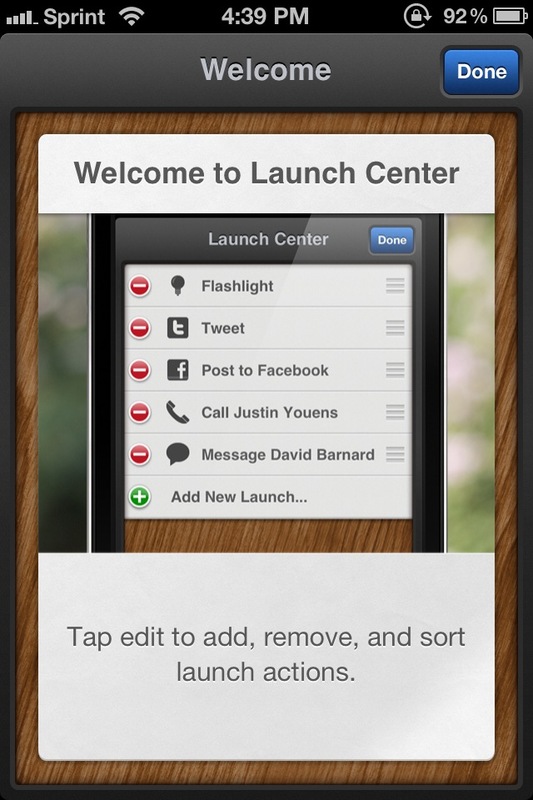 The original release of Launch Center was integrated with Notification Center. However, Apple rejected it for this purpose, even though they approved QuickPick, though that is now pulled as well. If you were hoping that Launch Center would be integrated with Notification Center, this will be a deal breaker, and it's unclear if Apple will ever allow such functionality. 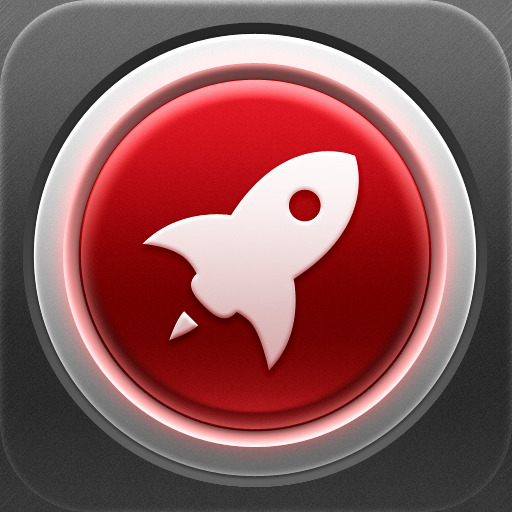 However, if you just want a quicker way to launch your most-used functions (and have a nifty little flashlight to boot) in a beautiful interface, then give Launch Center a look. 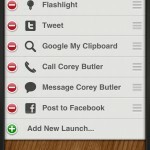 Just don’t be mad at the lack of Notification Center integration.